Thyro-Tabs are supplement thyroid hormone and manages symptoms of hypothyroidism. 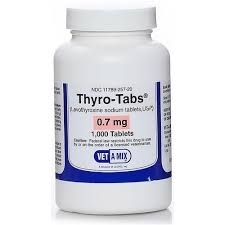 DESCRIPTION:Thyro-Tabs is a tablet that is given by mouth to pets who have hypothyroidism. These animals are unable to produce proper amounts of thyroid hormone. This medication helps to regulate thyroid hormones level which helps to promote normal body function. INDICATIONS: Levothyroxine is a synthetic version of the hormone thyroxine that is normally produced by the thyroid gland. It works to supplement thyroid hormone in pets with an underactive thyroid gland(hypothyroidism) in order to sustain normal body metabolism. CONTRAINDICATIONS: Discuss all medications and supplements your pet is taking with your veterinarian before giving Levothyroxine. Some interactions may occur with epinephrine, norepinephrine, insulin, estrogens, warfarin, or digoxin. Other interactions are also possible. Do not use in animals with a known allergy to Levothyroxine. Caution should be used older or debilitated animals and in pets with heart disease, high blood pressure, Addison's disease (hypoadrenocorticism), or diabetes.Do not use in animals with hyperthyroidism (an overactive thyroid gland). PRECAUTIONS:The clinical effects of levothyroxine sodium therapy are slow in being manifested. Overdosage of any thyroid drug may produce the signs and symptoms of thyrotoxicosis including, but not limited to: polydipsia, polyuria, polyphagia, reduced heat tolerance and hyperactivity or personality change. Thyro-Tabs 0.7 mg tablets contain FD&C Yellow #5 (tartrazine) which has been associated with allergic-type reactions (including bronchial asthma) in susceptible humans. It is unknown whether such a reaction could also occur in other animals. Levothyroxine is generally well tolerated when it is given at the correct dose. Levothyroxine can cause an allergic reaction in some pets but this is rare. Symptoms of an allergic reaction include swelling, pale mucous membranes, shock, vomiting, and diarrhea. If your pet seems sick in any way after taking Levothyroxine, call your veterinarian immediately. DOSAGE AND ADMINISTRATION: Levothyroxine is given orally. Always follow your veterinarians exact instructions. Your veterinarian will require blood testing periodically to ensure that your pet is receiving the proper dose of medication. Give your pet medication as soon as your remember if you forget to give a dose but do not give two doses at one time. Do not give Levothyroxine to any pets other than whom it has been prescribed for. Uses: This medication supplements hypothyroid pets with thyroid hormone that they cannot make on their own. Possible Side Effects: Levothyroxine is generally well tolerated when it is given at the correct dose. Levothyroxine can cause an allergic reaction in some pets but this is rare. Symptoms of an allergic reaction include swelling, pale mucous membranes, shock, vomiting, and diarrhea. If your pet seems sick in any way after taking Levothyroxine, call your veterinarian immediately. STORAGE:Store at room temperature out of reach from children and pets.